The number of people working from home has grown at an even faster rate than that of transit ridership. Turns out, Seattleites are more adaptable than we thought. That’s my take-away from what’s happened since the Alaska Way Viaduct closed down for good Jan. 11. There were dire predictions. Many anticipated a traffic catastrophe — the so-called Viadoom. But as The Seattle Times reported last week, that hasn’t materialized. Traffic is only a little worse than usual. 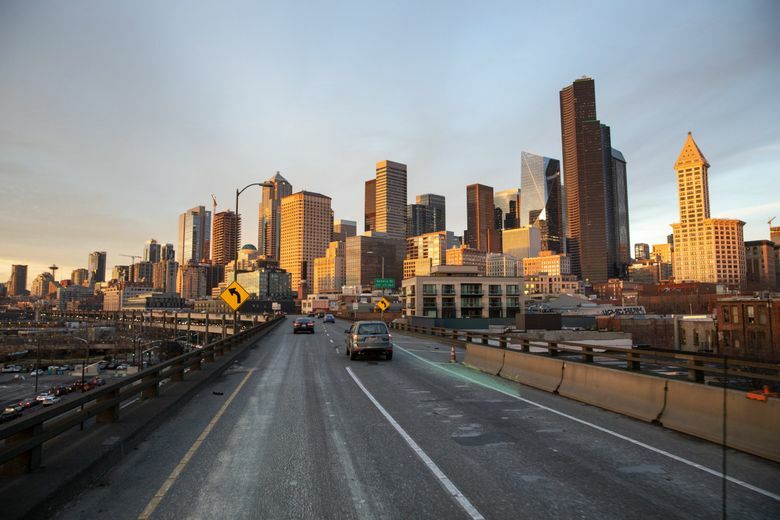 Those 90,000 vehicles that used the viaduct on a typical day have seemingly vanished. Why? Because we changed our behaviors. We’ve been taking fewer car trips, and finding alternate ways to get around. Transit and biking are both up, the Times story noted. Another likely factor: More of us are working from home. In advance of the viaduct closure, a number of companies and major employers, including the University of Washington, granted that flexibility to more of their workforce. While you may not have noticed, this is one change that actually began long before the threat of a Viadoom. Census data show that as of 2017, the most recent numbers available, roughly 125,000 people in our metro area worked from home most days — that’s up 56 percent since 2007. It’s a huge increase, but the rise in working from home simply hasn’t gotten that much attention. Local media, including this column, have frequently reported on the growth in the number of transit riders in Seattle. So it might be a bit surprising to find out that working from home has increased at an even faster rate in recent years. In fact, among the major commute modes, the fastest-growing is working from home (if you can even call it “commuting”). This trend, it should be noted, is not unique to Seattle. Working from home is also the fastest-growing commute mode in the U.S.
One way people work from home is telecommuting for their employer, which is facilitated by the internet and other advancements in technology. Other people work from home because they’re self-employed. But it’s clear from the data that only one of these two is behind that rapid growth in working from home in the Seattle area: Telecommuters. The number of local telecommuters more than doubled between 2007 and 2017. They grew at a rate almost seven times faster than the self-employed. Telecommuters for a private company now represent nearly half (46 percent) of those who work from home, up from one-third in 2007. An additional 8 percent of telecommuters in the Seattle area work for local, state or federal government. Even with the increase in telecommuting, it’s still a relatively small number of folks who have the opportunity. For many jobs, it’s simply not feasible. And some employers are reluctant to grant that flexibility to employees. Even though research shows that telecommuting actually increases productivity, there’s probably still some lingering suspicion among employers that when folks are allowed to work from home, they wind up sprawled out on the sofa playing video games. The option to telecommute is generally considered a perk, and made available to higher income, white-collar workers. A 2017 Flexjobs report showed that the average telecommuter makes about $4,000 more than than nontelecommuters. And telecommuters tend to be older, suggesting that relatively senior employees are more likely to be trusted with the privilege. 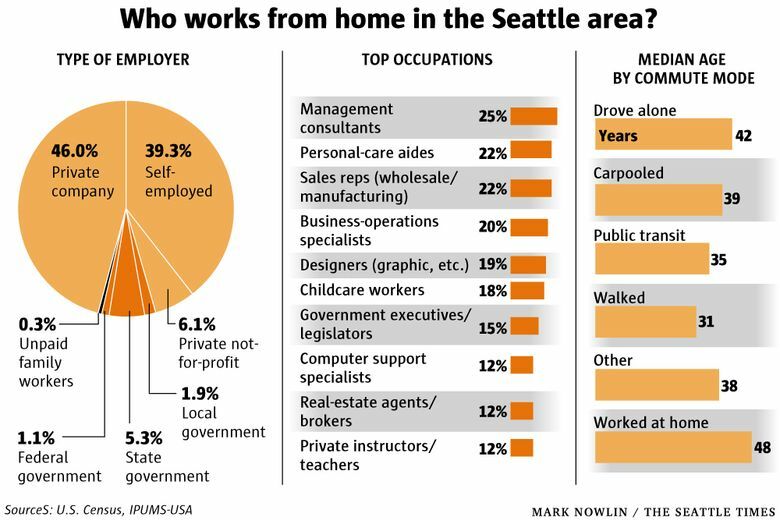 In the Seattle area, census data show that among the 50 largest occupations, management consultants are the most likely to work from home — one in four does so. The data also show that those who work from home have the highest median age of any commuters, at 48 years. 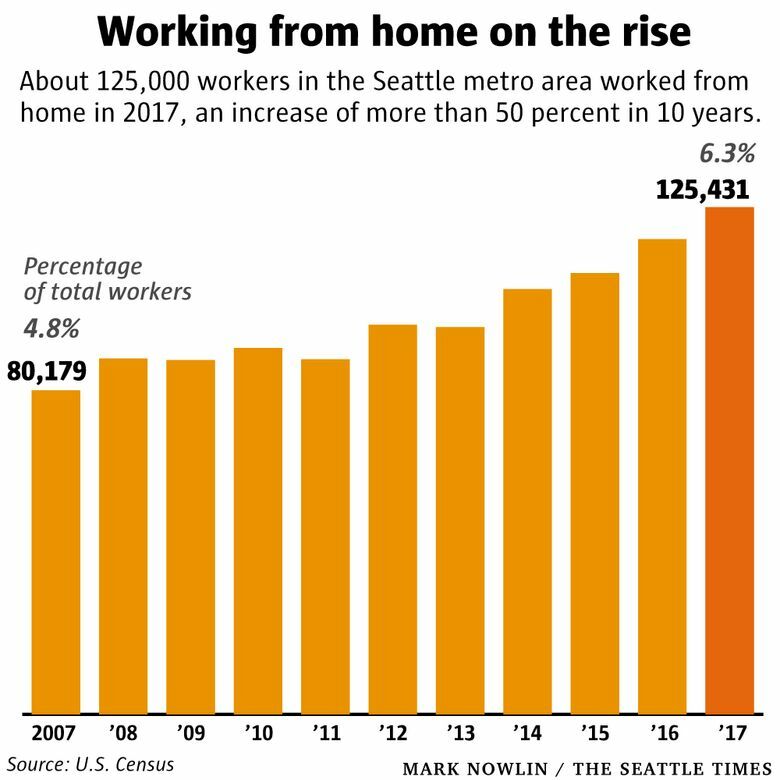 We don’t know how many more people are working from home in the wake of the viaduct closure, but it seems likely that the numbers have increased substantially. And if folks show they can demonstrate that they’re productive working from home during the closure, why shouldn’t they continue to have that flexibility once the new tunnel opens? Of course, that’s up to the employers. We’ll have to wait and see if next year’s census data show a spike in the number of us whose commute to work isn’t a commute at all.